ACTB-1003 is an oral kinase inhibitor targeting cancer mutations (FGFR inhibition), angiogenesis (inhibition of VEGFR2 and Tie-2) and induces apoptosis (targeting RSK and p70S6K, downstream of PI3 kinase). NVP-BGJ398 phosphate is a novel selective, pan-specific FGFR inhibitor with IC50 of 0.9, 1.4, and 1 nM for FGFR1, FGFR2, and FGFR3, respectively; >40-fold selective for FGFR versus FGFR4 and VEGFR2, and little activity to Abl, Fyn, Kit, Lck, Lyn and Yes. FIIN-3 is a potent, selective, irreversible and the next-generation covalent FGFR inhibitor. Li Tan,etc. Development of covalent inhibitors that can overcome resistance to first-generation FGFR kinase inhibitors. Proc Natl Acad Sci USA. 2014 Nov 11; 111(45): E4869–E4877. Alofanib is a potent and selective allosteric inhibitor of FGFR2 with potential anticancer activity. Erdafitinib is a potent and selective orally bioavailable, pan fibroblast growth factor receptor (FGFR) inhibitor with potential antineoplastic activity. AZD4547 is a potent, selective and orally active pan-FGFR inhibitor, with IC50s of 0.2, 2.5, 1.8 and 165 nM for FGFR1, 2, 3 and 4, respectively. 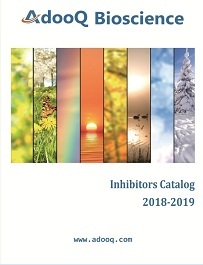 BGJ398 is a potent and selective inhibitor with potential antiangiogenic and antineoplastic activities of fibroblast growth factor receptor (FGFR) tyrosine kinases 1, 2, 3 and 4 (with IC50 values of 0.9, 1.4, 1.0 and 60 nM for FGFR1, FGFR2, FGFR3, and FGFR4 respectively). FGFR4-IN-1 is a potent inhibiotr of FGFR4 with IC50 of 0.7 nM.